Israa at her sewing machine. Photo by Erin Wilson/Preemptive Love Coalition. Israa welcomes us into her home—a small, dark apartment a few floors above the street. We ask “How are you?” and get the classic cultural answer: “I’m fine.” If the house was burning down around us her answer would be the same. But we sit down and talk with her son about school. We talk with Israa about how she met her husband at a wedding when she was 17, how he fell in love with her the moment he saw her. The fuller, truer answer to “How are you?” comes out in pieces of story strung together over the afternoon we spend together. “How are you?” Israa works long hours at a government office. She doesn’t have a coveted job as a permanent employee; instead, she works as a day laborer, writing official letters and correspondence. Despite the fact that she never went to high school, she’s fast and accurate on the computer. She stays longer than anyone else and works harder than anyone else, in hopes of one day being offered a permanent position that would mean security for her children. “How are you?” Israa earns $126 per month. The rent for their apartment is $168 per month. No matter how many hours she works in hopes of getting a more secure job in the future, she still doesn’t earn enough for the rent now, or for food for her children. Like so many of the working poor around the world, Israa works hard. If effort alone provided security, she would be rich! Pillowcases being made. Photo by Erin Wilson/Preemptive Love Coalition. 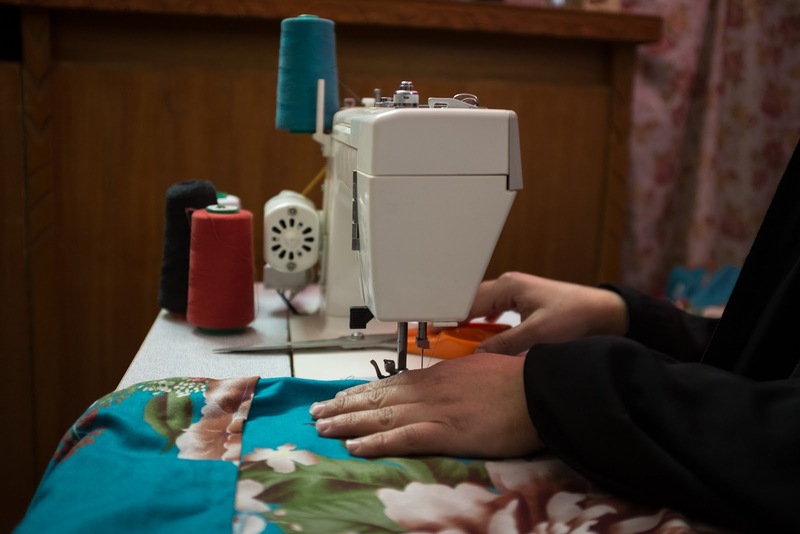 Israa was given the chance to open a small business of her own with a grant you provided. She already knew how to sew—she was taught by her sisters when she was younger. She decided that making sheet sets and decorative bedspreads would be the perfect business for her. This work would allow her to spend her extra time at home with her children, and it would make up the gap in her income. Israa likes sewing. She enjoys making beautiful things for the relatives, neighbors, and friends who come to her for wedding gifts. She continues to learn new techniques in order to expand her product line. And the amount of hours she invests has a direct payoff into her pocket. When she works hard at sewing, she earns more for her family, and the money is available to her immediately. The answer to “How are you?” is complicated. But Israa is hopeful. She is working toward providing a secure future for her children—it’s the only thing she dreams of in life. This is what your small business grant did in Israa’s life—you gave her the practical means to have some control of her future.